Simon Rothmore, Earl of Merrick had dedicated his entire life to one purpose, serving his country. Finally, after years of unrest, there was peace, as Bonaparte was finally captured and exiled to the island of Elba. At least there a semblance of peace, for in the country of Leaudor, a coup had taken place killing most of the royal family. The princess was in hiding, and Simon was determined to find and protect her. Princess Isabella Chastaine had lost almost everything. Her family was dead, but she needed to stay strong and return to Leaudor. It was her duty to restore order to her country, and rout her family's murderer. At first, she was understandably uncertain of Simon, but his unfailing support soon made Isabella realize that Simon might be the only hope she had of returning to Leaudor and ascending to the throne. Yet that hope was tempered with the knowledge that success of her mission would mean the loss of Simon, for they both knew there was no hope for love between the Queen of Leaudor, and one of England's most faithful servants. 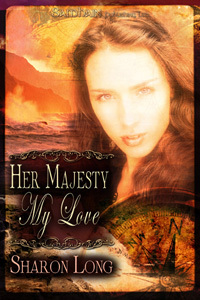 I was ensnared by Her Majesty, My Love from the first page. It will make the readers ache for the loss Isabella felt over the murders of her family members, anxious as Simon and Isabella continue a journey fraught with peril to Leaudor, entertained by the unique culture that is Leaudor, and cheer as Simon and Isabella finally find their ending together. Sharon Long is definitely on my list of authors to watch.